There are no two ways around it, there’s a high demand for developers and engineers not only in the Bay Area, but around the country. There’s a war for talent, as we touched on here, and it’s well worth finding a new approach to not only courting that talent, but producing it. A computer science degree from a private college today could mean a stellar education, but the cost is high. Alternatively, there are services like CodeAcademy that will teach you for free, or engineering courses on Lynda.com for a fee, and many more. There are more than enough accelerators, but that’s not where you go to learn how to code from scratch, so, when it comes to the full immersion, there aren’t too many choices. That’s why Shereef Bishay started Dev Bootcamp, a 10-week program designed for both beginners and experienced programmers with headquarters in downtown San Francisco. The program focuses specifically on Ruby On Rails, and, as its name would suggest, puts learners through the ringer — 400+ hours of intense technical training. The cost, with a $1K discount for signing up early, is $11,200, which can be paid in a lump sum or in monthly payments over two years. While that may sound like a lot, compared to the cost of a 4-year education, it’s minimal. Of course, it’s all about the value and what you get for what you pay. 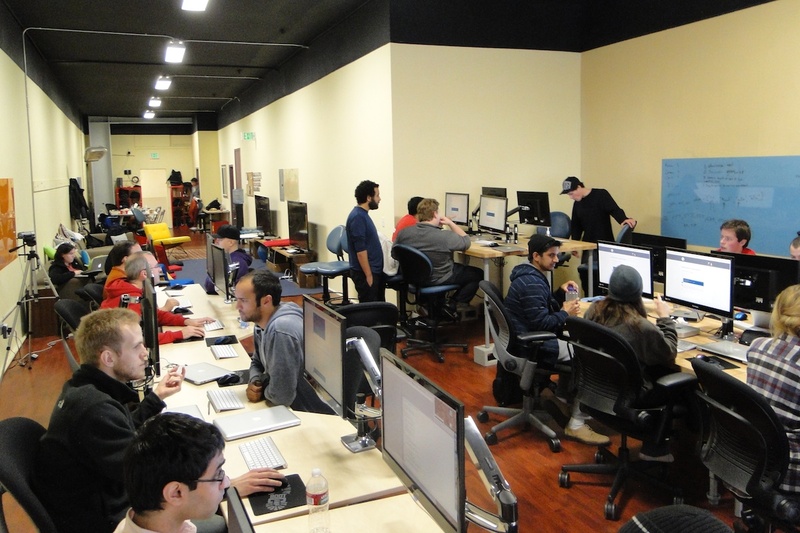 The goal of Dev Bootcamp is to have developers job-ready at the end of the program. Its first session, which ended on March 30th, had over thirty employers on hand to “speed date” the class of newly minted Ruby developers. And in terms of the value, judging by the responses from the community on Hacker News, there were more than a few who said that, of those they knew who had both studied independently and gone through Dev Bootcamp, the latter was “way more productive,” according to HN user shawndrost. There’s no assurance from Dev Bootcamp that its students will be hired after the program is over, but if they are, Bishay receives a finder’s fee for the hire, which he puts back into the program, and reimburses the student with $5K-worth of their total tuition. But here’s the real kicker: Of the 17 developers that were ready to go to work at the end of the program, to date, 14 of them have secured job offers — that’s 88 percent — with the average salary being $79,000. As to who did the offering? One participating student told us that ThoughtWorks, Ooyala, DailyKos, Inigral, MochaLeaf, Zendesk, Milyoni, and GeneralThings all made offers to Dev Bootcamp students, and had confirmed that students had accepted junior positions at the latter four startups. Not bad for 2.5 months of work. The second session of Dev Bootcamp, which runs from June 11 to August 17 is already full, but applications for the fall session (October 1st to December 7th) are currently open. Bishay said that the process by which the team is educating its developers is becoming more and more efficient as they go, as the learning curve flattens out. For the second round, they’ve opened it up to 40 students, with five teachers among them. But with the kind of talent it already seems to be drawing, and the ROI that’s already evident in the number receiving job offers, it won’t be long until the waiting list is around the corner — or until Bishay begins thinking about launching this in other cities, or countries. It’s a great model, and Bishay and his team of four other teachers have done a lot to minimize the impact on the wallets of their students, while still managing to have established the potential for a lucrative operation for those involved. It’s enough to make me think seriously about taking a dance with Ruby. For more, check out Dev Bootcamp here.